I love Halloween. It’s a fun time when you can get fit with a an elite yet down to earth personal trainer in St.albert like me and do it with a smile on your face while doing exercises that mimic things you might have to do to survive a zombie outbreak. 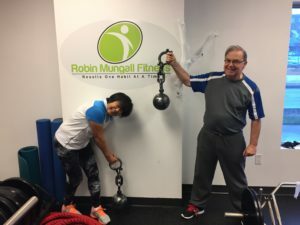 My clients Emily and John (retired local business owners) love how the workouts improve their energy, mobility and functional strength so they can live an active and happy retirement. Make no mistake, a fun “zombie outbreak workout” can test your fitness ability in a real world way. So not only are clients having fun, they are measuring themselves against potential real world situations that could happen at any time. Now if you are reading this and those tasks above feel like they would be a challenge for you and limits you from living a better quality of life, why not do something about that? Wouldn’t it be better to feel confident in your physical ability to handle everyday life with ease? Wouldn’t it be better to have more energy and zest for life? If you said yes to the above two questions, book a chat with me and let’s create a healthy lifestyle that works for you.